Borneo N 26 Chocolate 2.2 oz / 60 g (Eclat Chocolate) - Penn Herb Co. Ltd.
A blend of Eclat chocolate and La Boîte spices. 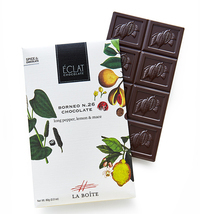 Made with 54% dark chocolate infused with Borneo N.26 (long pepper, lemon, mace and spices). Dark Chocolate (min. cocoa mass 54%, sugar, cocoa butter, soya lecithin, natural vanilla), Long Pepper, Lemon and Mace. Produced in a facility that handles peanuts, tree nuts, milk, and soy. Eat as is or, get creative and use it to elevate hot chocolate or any other delicious dessert.